GoJenGo is the major beneficiary of the funds donated by O.F.F./SHE4Life in the Charlotte, NC region. Click here to see the impact we’ve had on our community. CHILI COOK-OFF Entries. We need more contestants to go for the Title this year! Just bring a crock-pot and we’ll supply a table and power. Please send us an email, with your name and chili type to: OverlookFallFestival@hotmail.com and we’ll send you more info about the Friday 10/23 event. CRAFT BREWERS: Want to join in the Craft Brew tasting: Send email to the above email address. Oct 24th SATURDAY FESTIVAL TICKETS: $25 per family • Includes a PLETHORA of food and beverage • Available via SHE4Life.com by Oct 21st at this price $30 per family after Oct 21st, available at the gate. 2014 Overlook Fall Festival - El Cuatro Annual Turn Breast Cancer O.F.F. Overlook Fall Festival and Fundraiser. Come join us on Friday, October 24 for the Chili Cook-Off and Saturday, October 25, 2014 to enjoy music, food and fun times; all while raising money for those fighting breast cancer (and their families) in our local area in order to assist with their immediate needs. CLICK HERE for more information. Sponsor, Donate or Buy Tickets HERE! 2014 Overlook Fall Festival Raffle to win a $1250 value Stand-Up Paddleboard A $1250 value Stand-Up Paddleboard donation has been made by My Aloha Paddle and Surf in Cornelius, NC. My Aloha is the paddleboard expert serving the Charlotte and surrounding communities since 2010. Offering paddleboard rentals, lessons, yoga fitness, lake adventures as well as board sales from their waterfront location in Cornelius, NC. The winner of the raffle will have their choice of a NSP-SurfBetty Boarding for Breast Cancer edition 11'4 board, or an 11'2 Kuai'i Paddleboard Co. bamboo-grain top 11'4. Shipping, if necessary, will be free to the winner! Click HERE for raffle tickets. 2014 Terry McMillen / SHE 4Life Breast Cancer Tribute Program going on now through 9-26-14. Take a look at the OPTIONS available to you for participation in this year's Tribute Program. 2013 Terry McMillen / SHE 4Life Pink Tribute Program kicks off 9-13-13 and runs through 9-27-13, check out all the OPTIONS available to you for participation in this years' Tribute program. 2013 Overlook Fall Festival - Third Annual Turn Breast Cancer O.F.F. 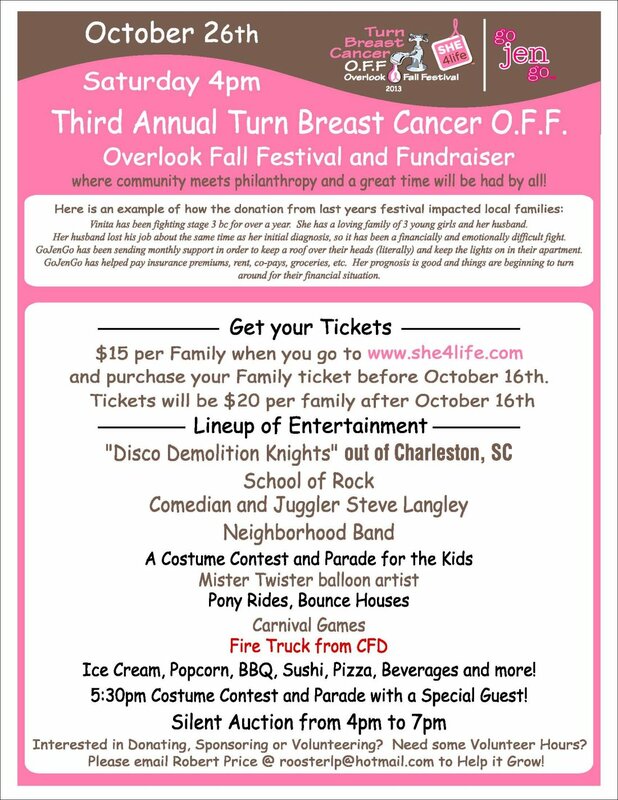 Overlook Fall Festival and Fundraiser Come join us October 26, 2013 at 4pm to enjoy music, food and fun times while raising money for breast cancer fighters and their families in our local area to assist with their immediate needs. Click Here for more information. BUY TICKETS HERE! The 2nd annual Overlook Fall Festival (O.F.F.) has chosen SHE 4 Life to be a charitable partner for this year's event on October 27th, 2012. Overlook is a neighborhood of over 400 homes in northwest Charlotte, and this years motto is "where community meets philanthropy and a great time is had by all", with the goal to "Turn Breast Cancer O.F.F." The event will consist of 3 live bands, bounce houses, pony rides, costume contests, games, a kids parade, and a silent auctionâ€”with the goal of raising funds so SHE 4 Life can help make an impact in the Charlotte community of breast cancer patients. The festivities kick off at 4pm with the "Neighborhood Band", followed by Tara Scheyer & the Mud Puppy Band (a kid-oriented set complete with drums and percussion instruments for the little ones to get involved) and closes with Sun-Dried Vibes--back by popular demand from last year's event. Local craft breweries and eateries will be donating food and beverages, and the neighborhood has gathered some great silent auction items such as VIP race weekends for NHRA and NASCAR 2013 events in Charlotte, birthday party events from Kate's Skates, a rare magnum of Cabernet wine from one of Napa's top Vineyard (Staglin Vineyards), and many gift cards from local businesses. Tickets (or donations) can be made via the SHE4life.com homepage - click the "DONATE" button for the O.F.F. festival. Tickets are $15 on the SHE4life website thru Sept 24th, and $20 at the gate the day of the event. For more information, or for silent auction donations, please contact JD Kramer at 765-661-5419, or JD@SHE4Life.com. Check out Nitro Rewind... Terry McMillen's portion ( around 3:30min) is about breast cancer awareness and SHE 4Life... THANKS Terry & Cori, you are an amazing team to have on our side.. SHE 4Life couldn't ask for any greater partners than you two!!! Click on link to watch clip!! Thanks to King Par Golf and their support of SHE 4Life. Their online store is featuring a promotion on SHE 4Life items... Check it out!!!! Shop King Par Superstore for all of your golfing needs. With the biggest names in golf such as Orlimar, Srixon, FootJoy, Nike, Intech, Adams, Callaway and Adidas, you'll find a huge selection of new golf clubs, golf shoes, golf balls, golf bags, golf apparel and more at KingParSuperstore.com. The Ebay auction winner for the autographed PINK JERSEY with proceeds going to SHE 4Life.. again, we can't thank ALL OF YOU enough for your support!! 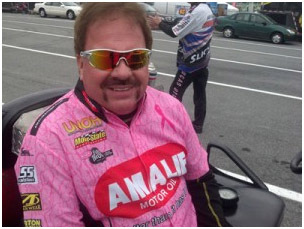 Las Vegas - Terry McMillen, driver of the Amalie Oil/UNOH/Motor State Distributing Top Fuel dragster, will bring his pink-themed car to this weekend's 11th annual Big O Tires NHRA Nationals at The Strip at Las Vegas Motor Speedway. McMillen hopes the team's month long campaign will help expand awareness of breast cancer. "We started this deal at the beginning of October," McMillen explained. "We really wanted to pay tribute to the men and women that have had to and continue to fight breast cancer. The whole thing has really taken on a life of its own. We really had no idea a bunch of guys running around in pink jerseys and racing a pink dragster would be as popular as it turned out to be. It has touched a lot of people in a lot of different ways. My phone hasn't stopped ringing. I'm honored we could play a small role in what has to be a challenging time for friends, family and for those that have to fight the fight." McMillen's pink dragster carries the names of friends and family of crew members, sponsors and those in the racing community that have breast cancer or have fought breast cancer. The team's pink jerseys are being auctioned off on eBay with proceeds going to She4Life. She4Life is a nonprofit organization that raises money, not for research, but for families that are struggling with the cost of fighting the disease. "I was out at the The Strip today and noticed all of the pink," McMillen said. "It's something special. I think a lot of people will be touched by the effort. I'm glad we can be a part of it." While McMillen's team will proudly sport their pink theme, they are fully aware of the race that is taking place. "This is one of the biggest races of the year for so many reasons," McMillen said. "You've got The Countdown looming with just two races to go. It's like game six of a seven game series. Anything can happen. We hope to influence the outcome - maybe just be a fly in the milk - just enough to mess things up for someone, but at the same time it's a great opportunity to get our program on track, maybe win some rounds and have a shot at winning this race." "We're looking forward to so many guests at this race with the SEMA and AAPEX shows following the race," McMillen said. "We have special guests that are Amalie distributors from all over the globe to some that are just a state away. We even got special guests from UNOH and Motor State Distributing. We've got about 150 special guests that will be pulling for us this weekend. No extra pressure or anything - just another reason to do well." Breast Cancer Awareness month also brought out support from Mechanix Wear Gloves, Cool Image Water, Vicci Custom Apparel and T & R Graphics. "It's all about pink," McMillen said. "Buck from Mechanix Wear gave us some pink gloves, Danny Graham from Cool Image Water provided some special edition water bottles, Lisa at Vicci gave us a great design on pink jerseys and Ray Murphy at T&R Graphics gave us a really great looking pink dragster to race with." Local support for McMillen's team continues to grow in the Las Vegas area. Findlay Chevrolet will again support the team with cars and tow vehicles along with Tahiti Village that provided outstanding lodging for the team in their suites. ELKHART, Ind. 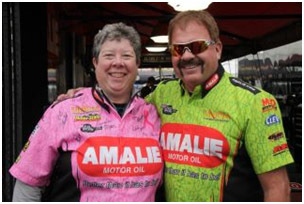 - Terry McMillen, driver of the Amalie Oil/UNOH/Motor State Distributing NHRA Top Fuel team, put the team's pink jerseys up for bid on eBay this week. The teams month long Breast Cancer Awareness campaign to bring attention to She4Life. She4Life is a brand new charity supporting the families and patients of breast cancer when the cost of treatments starts to put a burden on the patients. "SHE4Life is in its infancy stages, and we want to help them get up and running," McMillen said. "They are going to help patients by going into communities and putting their line of products into stores. Money from the sales will be put directly back into the community in which they are sold and I think that's pretty cool." To learn more about She4Life visit their Facebook page. One of the goals of SHE 4Life, is to be able to help breast cancer centers / programs not only assist breast cancer patients with financial burdens, but we would also like to help promote and support "kids count" support groups for children who has a family member battling cancer. These groups, which my sister help initiate one at Erlanger Hospital in Chattanooga TN, is very vital to help children process, relate, understand and live through the never ending changing process of what a diagnosis of cancer does to the entire family! This video was highlighted on CNN a couple years ago about the program at Erlanger and the value it has for all children, the family and for how all learn and grow together throughout the process! Help SHE 4Life grow, gain recognition and support so that our goals and heartfelt work can be accomplished!! NBCCEDP is a public safety net program run jointly by the CDC and state departments of health. It provides breast cancer early detection services to women who have no insurance and who don't qualify for Medicaid. Without NBCCEDP, they would likely fall through the cracks in our health care system and with current economic conditions, more and more of our friends and neighbors are relying on this critical program. Since 1991, NBCCEDP has provided more than 10 million screenings and diagnosed almost 52,000 breast cancers. This year alone, the program will provide hundreds of thousands of mammograms to underserved women across the country. We know that early detection of breast cancer is a key to surviving the disease. When breast cancer is detected early, before it spreads beyond the breast, the 5--year relative survival rate is 99 percent. If diagnosed when the cancer has spread to other parts of the body, relative survival rates plummet to 23 percent. So please reach out to your state lawmakers as soon as possible to let them hear your voice and concern that cutting screening not only could cost lives -- it also will cost states more and will increase the burden on the health care system. When breast cancer is detected at later stages, treatment is MUCH MORE expensive than when it is detected early. Please help support NBCCEDP -- Early screening and detection will help save many that you know and love!! Please help us do our part to speak out for all by contacting your local representatives and your state legislators to express your concern for decrease in funding for this program, we don't need any more battles for all who are fighting to survive from this disease and with Early Detection we can help raise the survival rate percentages!! Survive Hope Empower together... Make your voices heard today! !